If you've reached a plateau in your strength training, you may need to strengthen your stabilizers using exercise ball exercises to push past that sticking point. Excessive movement or instability in a joint stimulates receptors in the joints and muscles sending inhibitory messages (a negative feedback mechanism) to decrease the activity in the prime mover of the joint. This reduces power and strength. By stabilizing the joints, the prime movers or "mobilizing muscles" can exert a stronger force across the joint while strength training without stimulating these inhibitory messages to the spinal cord, weakening the effort. When you first start exercising with the ball you will not be able to handle as much weight. For instance, if you can bench press 100 lb for 10 reps, you may only be able to do 5 reps on the ball. Continue strength training with the bench press using the ball for six weeks until you reach the point where you can press 100lb for 10 reps on the ball. When you go back to the bench you will find you can press more than you could before. This is due to increased joint stabilizer strength and activity. You are only as strong as your weakest link, and often that is the core. Always put your tongue on the roof of your mouth when your head is not supported by the ball. This helps activate the neck flexors, stabilizing the neck without the risk of the neck extensors over-compensating. Another way to assist engaging the deep neck flexors when your head is not supported is to pretend you have a grapefruit stuffed between your chin and your chest. Hold that imaginary grapefruit throughout the exercise. For safety, always ensure you have a spotter to aid in the lifts, onto and off, while on the ball. Always clear the area you are training in to reduce the incidence of the ball being damaged. Always ensure that your feet are anchored by more weight than you are lifting. This ensures you do not flip over the ball and lose your balance. When first performing exercises on the ball with weights, start with about 60% of the weight you are accustomed to lifting and build up from there. It is better to be safe than sorry (always). Always warm up adequately before any exercise. When strength training on the ball, always inspect a ball for any marks or damage that may cause the ball to puncture. Ensure the ball is the correct size for you. To do this first choose the size (small, medium, large) recommended for your height for exercise. With the ball inflated to ~95% maximal diameter, the correct size ball will keep your thighs parallel to the floor or slightly raised so that your hips are slightly above your knees. Click here to find your size. For safety and optimal effectiveness always use a top quality ball. If your gym or personal trainer does not have the genuine article ask them to get one before you start to train. This will ensure you have the best equipment for the best workout to give you a jump-start on everyone else for a better physique. After all, it's your body! Click here to learn what to look for. 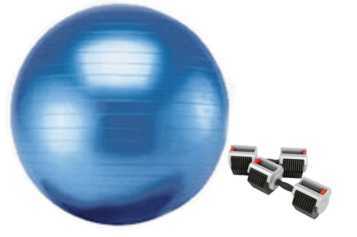 Where possible have your own exercise ball so that you can take responsibility for its care and use. That way you can train your abs at home or double it up as a chair. Muscle activity in trunk muscles and extremity muscles was measured through the use of surface electromyography during and overhead lift. 30 individuals that train regularly participated in a shoulder press for three sets of three reps with a barbell and dumbbells. Electrodes were placed over the trapezius, anterior deltoid, middle deltoid, rectus abdominis, triceps brachii, external obliques, and erector spinae to measure muscle activity on those muscles. Results showed that as the instability of the surface (ie bench vs ball) increased the load the individual was capable of lifting decreased. As the instability of the weight increased (ie dumbbells vs barbell), also, the load lifted decreased. The muscular activity in the erector spinae was greatest when performing the barbell and dumbbell presses on the exercise ball. In essence it seems intuitive that if we are to substitute a ball for a bench we must lighten the weight lifted as we start to recruit muscles needed to stabilize our trunk. 1. Kohler JM, Flanagan SP, Whiting WC. Muscle activation patterns while lifting stable and unstable loads on stable and unstable surfaces. J Strength Cond Res. 2010 Feb;24(2):313-21.